Beautiful get-away to the northwoods! Updated, year-round vacation home on Lake Vermilion--a premier north Minnesota lake on the edge of the famous Boundary Waters Canoe Area (BWCA). Perfect for family vacations, fishing, snowmobile groups, or people just wanting to get away for that relaxing, quiet escape up north! Kayaks, Canoe, and small 12 foot boat available on the property for a small fee. This year round house features knotty pine ceilings and walls, a vaulted living room ceiling, and a large deck overlooking the yard and water off both the kitchen and living room areas with a weber grill. Dish Satellite TV. Beautiful sunsets seen from deck. This house sleeps 6 to 8 people. There are two bedrooms on the main floor. The master bedroom contains a queen bed. The second bedroom on the main floor contains a full sized bed with a bunk bed over the top of it along with an extra mattress which can be used on the floor for sleeping. The living room on the main floor has a fold out couch plus a second couch. In the walk-out style basement there are four beds- a queen, two fulls, and a single bed. There is air conditioning in the house for those hot summer days and also a sauna in the basement. This property offers plenty of space in the house and yard with rock landscaping, trees on both sides of the yard for privacy and that northwoods feel, a level shoreline area, campfire area by the water, and private dock! There is a summer guest cabin available close to the house to help accommodate larger groups also if you are interested in renting the guest cabin separately. Great walleye, musky, bass, northern fishing year round and excellent crappie fishing very nearby in September/October and also in the winter on the ice. 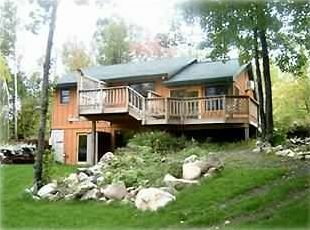 This house is on the Pike Bay/Pike River Inlet of Lake Vermilion, a desirable part of the lake on the southeast portion near Tower. In the winter, there is easy access to miles of northwoods snowmobile trails in the woods or on the lake. Snowshoe, cross-country or downhill skiing, and nature hiking trails are nearby also. Ice fishing house rental and guided ice fishing trips are available-phone numbers provided for you. Great walleye ice fishing and panfish/crappie ice fishing nearby--directions and information provided for both of these. Fortune Bay Casino is four miles away. Giants Ridge downhill and cross-country skiing is close. A gas fireplace in the living room next to the couch awaits! There is also a sauna in the house. Propane furnace heated house in the winter. Lake Vermilion, much of it undeveloped, is in the Superior National Forest and is on the edge of the Boundary Waters Canoe Area. Alongside nature, there are lakeside restaurants. It is a 40,557 acre, 27 mile long lake with 360 islands and several bays. In the winter, several groomed snowmobile, snowshoe, or cross country ski trails are throughout the woods and on the lake. In the summer, this lake is big enough so that even on a Saturday afternoon, boat traffic is often light so you feel your on a quiet lake out there fishing, boating, or sitting on the beach! This lake is one of Minnesota's premier fisheries and lake vacation destinations. The fishing is excellent - musky, walleye, northern, bass, and crappie. 5000 musky stocked annually since 1987 and aggressive walleye stocking programs. A pro fishing guide is in the area for year round spring through winter fishing if you are interested. Information on good fishing spots is provided. Good crappie fishing nearby in the fall! A few boat launches close to the house. Canoe and paddles available. Fortune Bay Resort with Golf and Casino is four miles away as well as many other golf courses in the area. I have information on how to get to the trails/beaches. This vacation house is winterized with heat in the winter and air conditioning in the summer. It sleeps 6 to 8 people. Cool sleeping during those hot summer nights available with A/C on main floor and cool sleeping in the walk-out basement. Welcome to our house on Lake Vermilion! This has been a perfect getaway for our family for long quiet weekends, large family gatherings, fishing trips, and entertaining friends over the years. We love to go up north to fish, relax, go on walks with the dogs, snowmobile, swim, or sit around the campfire. We live a busy life in the cities and love to get up north once in a while to get away. We hope you enjoy your vacation up north! We chose Lake Vermilion because its a beautiful lake with that boundary waters feel. Excellent fishing, glacial rock everywhere, islands, not much boat traffic. Next to this wilderness type setting, there are restaurants, sports bars, shops, wildlife museums--plenty to do besides just being on the lake. The area by this house has wildlife everywhere--birds, deer, loons, beavers, and an occasional eagle. The house is on a private road as well which is great for walks! Plenty of level parking on site. Some towels provided. Guests are encouraged to bring own beach towels and bath towels. Fully furnished w/ all appliances, plates, silverware, cups, coffee maker, etc. Seats 4 at main table, plus 3 on counter stools by kitchen counter, plus 8 outside on deck. Deck furniture and grill provided. Sauna with shower next to it in basement of the house. Very nice, communication was clear, organized, and timely. Enjoyed our stay very much. It was a very cold weekend but we were cozy . Bart was very communicative, organized, had clear instructions, contacted us with all the needed information and was very friendly. I’d stay there again. The place easily accommodated 6 . Thanks very much Theresa and we hope to have you as guests again in the future! The house was perfect for our needs. Good experience. Bart was great in providing information beforehand and accessible to all questions. He always responded in a timely manner. We would recommend it and would use it again. The house did not have wi-fi which turned out to be great. We all unplugged for three days and had real quality family time. Very nice, very roomy and well stocked. The kitchen is laid out efficiently. The equipment, pots/pans, cutlery, dishes etc. are nicer than in most other rentals we've stayed at. The hot tub was covered and we didn't use it but the sauna works well. The property owners on this road belong to some kind of association and everything is pretty nice. Road is well really well maintained. Planning on coming back. Great cabin for fishing trip. Bart was very helpful with any questions that we had about the area. Also, had a lot of info to get started fishing. Many boat landings close by as well. Plenty of parking at the cabin. We had three trucks with fishing boats. All in all it was everything as advertised. Looking forward to next year. Owners nice to work with. Great place. First of all, Bart was great to arrange things with. Very informative and I could tell he wanted us to have a good time at his place. House was as advertised plus some. Plenty of place to sleep my group of 8 plus babies. He has fishing maps and tips to help guide you and they were great. I would recommend getting a detailed map of your own if you are not familiar with Lake Vermillion to take on the boat for navigational purposes and to explore your own fishing areas also. Great experience. Our family had a great time. Especially loved all the beds in the basement for all of the kids. We offer various rates for winter, spring, summer, and fall. Weekend rates available in winter. Taking reservations for the holidays, winter, and summer. Please call/email for rates and availability. Year round rates. Please contact us if you don't see rates for a certain month. No smoking in the house. Dogs allowed with owner approval only. Only dogs allowed as pets.